But the other night, she got her second (you read correctly) black eye in her short little life. The worst part about it is that Hubby, one of my girlfriends and I were all sitting right there, hanging out and playing in the floor with her. Then one wrong move, and boom. Into the brick hearth my baby’s face went. It was so fast I wasn’t even sure it happened. But you know what came next: that crying-without-making-noise thing they do. Their face is screwed up, their mouth is wide open, air is moving through there, but no sound is coming out. Then just as you think they will possibly pass out soon, in goes a huge gulp of air and out comes a wail. 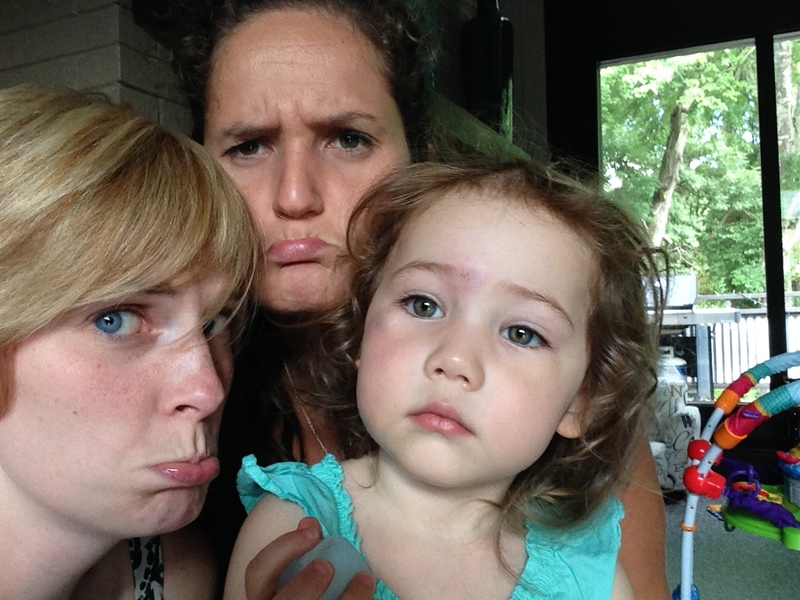 EK, my friend Katelyn and me, all sad about the big booboo. As the mama, you set the tone for what comes next. There are two ways you can play this. #1: Give in to the panic that blood will obviously be coming out of a gaping hole, your daughter most certainly lost at least one eye, and you should prepare to head to the ER. #2: Try to keep calm. Scoop her into your arms, comfort her till the worst of the crying subsides (or at least till her breathing gets a little more normal), softly ask Hubby to get some ice, and assess the damage without any frightened screams or dramatic gasps or word vomit about how nervous you are that she will have a scar the size of Texas. Somehow, I was able to stick with #2. I was calm on the outside, no matter how fast my heart was beating, and EK calmed down fairly quickly, too. I have learned that my reaction is everything. Even more than how she initially feels, my reaction directly affects what she will do. In this case, she milked it a little for a few extra kisses, carried around her ice for 20 minutes, but was back to normal shortly with the promise of yummy dessert after dinner. It’s amazing how a parent’s body language and words are mimicked by a little teeny girl. If I make a huge deal, so does she. If I grunt when I bend down to pick something up (like when I’m pregnant), she does the same. Seriously, it’s been six months, EK. You can stop.